Heading into Sunday against Jay Cutler and the Chicago Bears, the Redskins have accumulated 21 sacks through 12 games, tied for 25th in the 32-team league. That's not exactly setting a high bar. Knighton's larger point was this: Whatever the sack totals, Washington is doing a good enough job putting pressure on QBs. 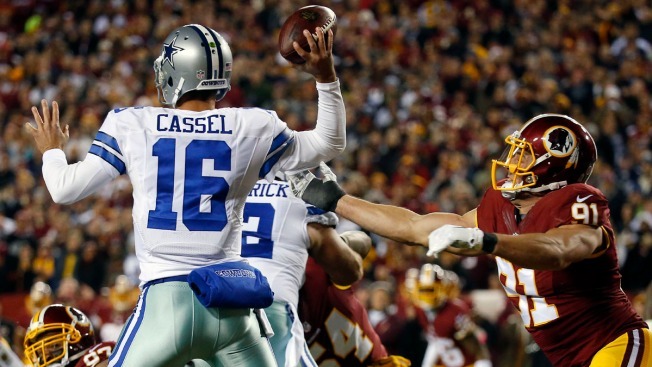 In a 19-16 loss to Dallas on Monday night, the Redskins (5-7) sacked Matt Cassel just once, despite using the occasional blitz, particularly on third downs. “That's our objective every week -- first down, second down, third down, it doesn't matter -- to harass and to get after the quarterback,” defensive coordinator Joe Barry said. Linebacker Ryan Kerrigan leads Washington with 6 1/2 sacks, while defensive end Chris Baker, a former practice squad player who pushed his way into the starting lineup, is next with five. No one else has more than three. The Bears (5-7), meanwhile, suddenly are quite adept at protecting Cutler, thanks in part to offensive coordinator Adam Gase's reliance on get-the-ball-out-quick screen passes, particularly against more aggressive defenses, and getting rid of the five-step drops that used to lead to sack after sack. Chicago's QBs have been sacked only 20 times this season and hit just 57 times. Washington's defensive line could be missing Jason Hatcher at Chicago because of what he said was a pinched nerve in his neck, but regardless of who is on the field, that front four has one request for Barry: Don't start dialing up a bunch of blitzes. So far this season under its new coordinator, Washington blitzes on 13.9 percent of plays, lower than all but two teams (Dallas and Chicago, coincidentally), according to STATS. Last season, under coordinator Jim Haslett, the Redskins ranked 11th in the NFL at 22 percent, STATS said.